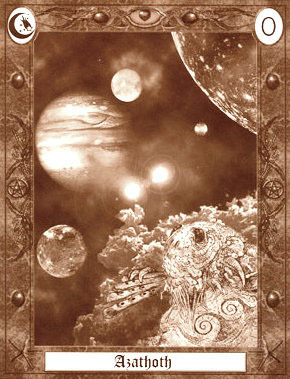 The H. P. Lovecraft Tarot cards were illustrated by artist Daryl Hutchinson and are printed in duotone, in varying shades of sepia and white. The minor arcana consist of the Suits of Man, Artifacts, Tomes and Sites; the Major Arcana consist of entities and creatures of H.P. Lovecraft and the Cthulhu Mythos. The major arcana cards are: Azathoth, Nyarlathotep, Yog-Sothoth, Shub Niggurath, Hastur, Cthulhu, Lavinia, Ithaqua, Shoggoth, Great Race of Yith, Hounds of Tindalos, Mi-Go, Deep One, Ghoul, Old One, Tsathoggua, R'lyeh Rising, Nodens, Night Gaunt, Yig the Serpent God, Cthulhu Awakens and The Crawling Chaos. The minor arcana cards are: The Suit of Man: H.P. Lovecraft, Randolph Carter, Inspector Legrasse, Charles Dexter Ward, Erich Zann, Herbert West, Captain Obed Marsh, Wizard Noah Whateley, Wilbur Whateley, Wizard Edward Hutchinson, Dr. Henry Armitage, Crawford Tillinghast, Harley Warren, Keziah Mason. The Suit of Artifacts: Star Stone, The Colour Out of Space, Silver Key, The Shining Trapezohedron, Guardian of Kadath, The Yellow Sign, EOD Vestments, Resonator, Pickman's Model, Mi-Go Brain Cylinder, Bokrug, Stone of Nepemiah Derby, Liao the Plutonian Drug. The Suit of Tomes: Necronomicon, De Vermis Mysteriis, Unaussprechlichen Kulten, The R'lyeh Texts, The Dhol Chants, Libre D'Eibon, The King in Yellow, Cultes Des Gouls, The Pnakotic Manuscripts, The Eltdown Shards, The People of the Monolith, The Ponape Scriptures, Seven Cryptical Books of Hsan, The Black Book. The Suit of Sites: Yuggoth, Irem City of Pillars, Plateau of Leng, Whateley Farmhouse, The Witch House, The Mountains of Madness, St. Toad's, Innsmouth, Kadath, Exham Priory, Sentinel Hill, EOD Temple, Federal Hill, Arkham.